Editor’s Note: This week we’re catching up with last year’s Debs and seeing what they’ve been writing, publishing and working on since they were last on the Ball. 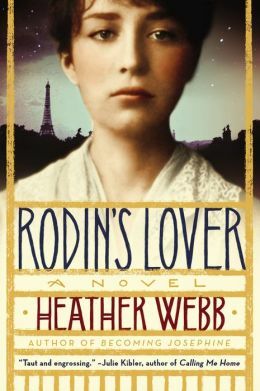 Today, we welcome back HEATHER WEBB, author of BECOMING JOSEPHINE and the recent RODIN’S LOVER. Thank you, Debs, for the invitation to return! It’s great to be back, even if for just a quick visit. What’s happened since I said goodbye to The Ball? So many things! 1. Rodin’s Lover, a novel about the tumultuous love affair between Rodin and his collaborator, brilliant sculptor Camille Claudel, released in January this year. Given my completely nutty emotional state during the time (as well as the massive blizzard), the continuous stream of great reviews and national publicity buoyed me! I’m so proud of where my little book has gone. In fact, to honor my beloved Camille, I got extra crazy and decided to host a book & charity event to benefit women in the arts in San Fran last month. It was a blast! 2. As a Downton Abbey addict, I can’t get enough WWI era so I decided to put together an anthology of novellas themed around the original Armistice Day. I wrote a pitch, gathered 8 other talented authors, and it SOLD (!) to HarperCollins. After much celebration, I labored over my story this spring and sent it off, where it now resides in my editor’s hands. A FALL OF POPPIES will release sometime early next year. 3. BUT WHAT MORE OF NOVELS, you ask? I’m cranking away on the final few thousand words of my third novel. This time, I’m busting out of the biographical realm. This book is shaping up to be a bit of a Gothic thriller set during Belle Epoque France. I’m hoping I can talk all about it sometime this fall. 3. As a former teacher (and now freelance editor), I have a ton of fun presenting at conferences and helping other writers, so when the invitation came to lead a writing and touring retreat in Galway, Ireland this summer, I jumped at the chance! The tour is booked full, but there is a waiting list! 4. I’m still out and about quite a bit. Please stop by my events page so we can meet! Next up for me? I’m the keynote speaker at the UConn Young Writers’ program next week, and then I head to Denver for the Historical Novel Society con in June. Want more? You can find Heather on the Web (haha!) on Twitter and Facebook! Damn girl, you’ve been busy! But I would expect no less. Keep up the good work. Hi Heather! Can’t wait to hear more about your Gothic thriller!